I’m a little embarrassed to admit I peaked on the first hole of the day. 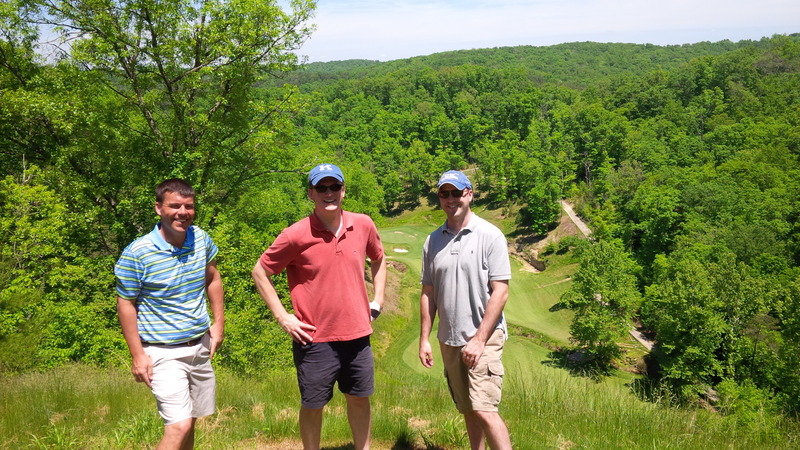 Sunday, my growing band of merry-men completed the second leg of our season-long Kentucky’s Best golf tour, this time crossing Eagle Ridge Golf Course at Yatesville Lake State Park off the list. On behalf of all that have played Eagle Ridge, I’d like to swift-kick architects Arthur Hills and Steve Forrest right in the shins. 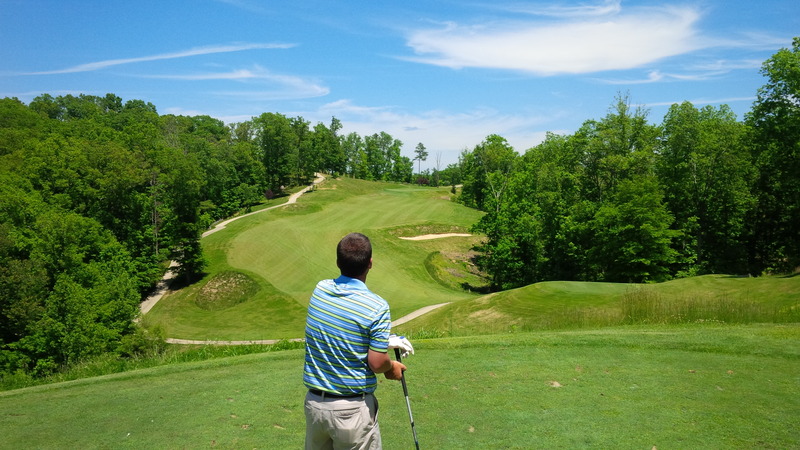 The course is, by far, the most visually and mentally intimidating golf course I have played in Kentucky. 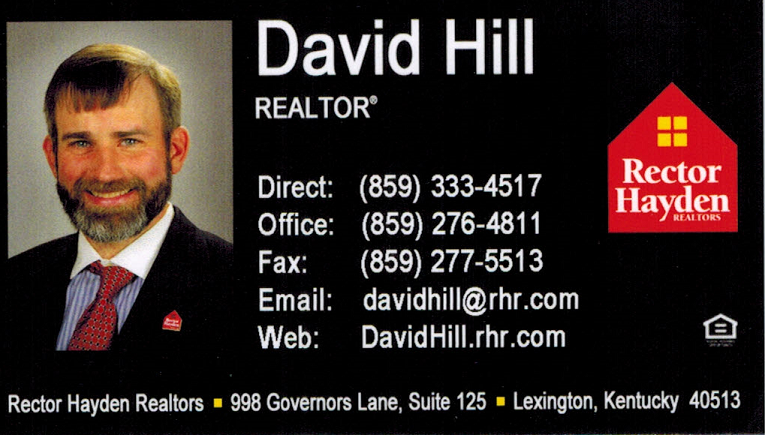 Yes, strictly speaking, in terms of length, slope, and course rating, there are more difficult courses in Kentucky. I’m confident that Valhalla, Triple Crown, and Persimmon Ridge, among many others, rate and play as more difficult tests of golf. 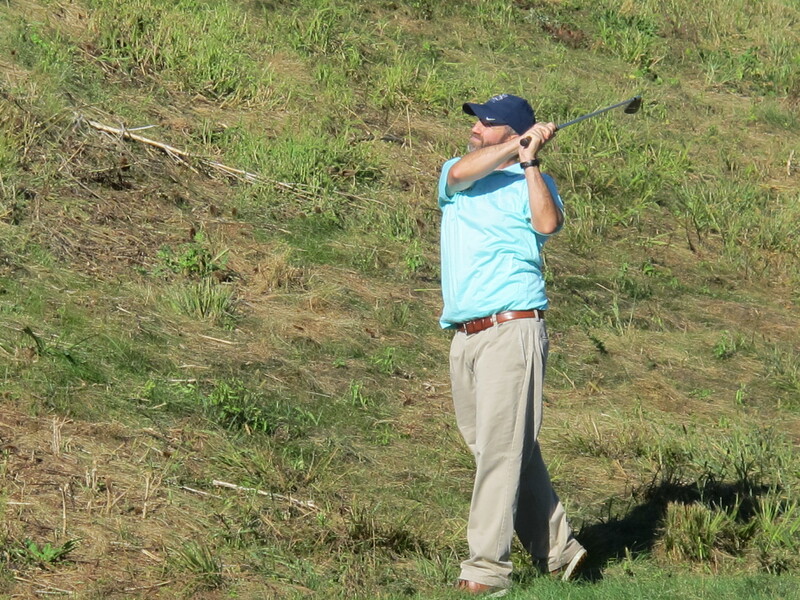 I will be a lot more confident on the 2nd tee the next time around. Seriously, where was I supposed to aim? 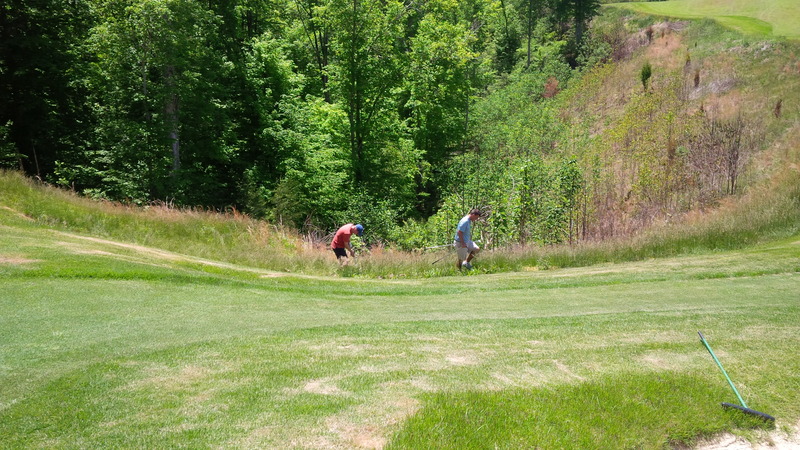 However, not since playing Oxmoor Valley and Silver Lakes on the Alabama RTJ Trail have I had a golf course assault my senses and my confidence in the way that Eagle Ridge tore me up this weekend. 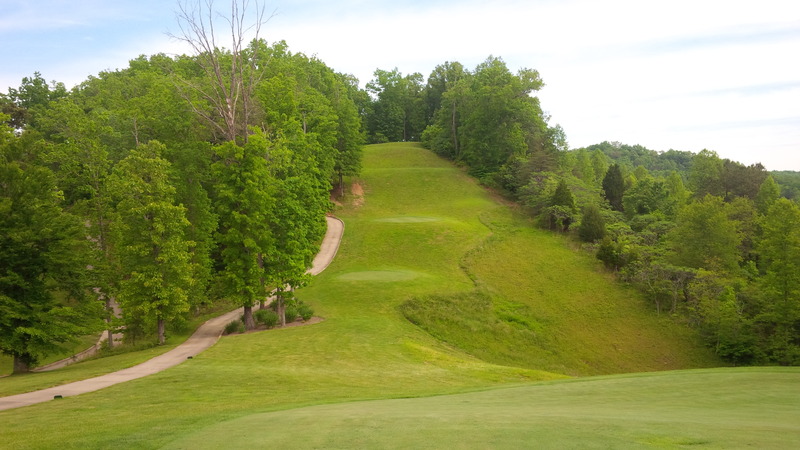 Set high upon the mountaintops abutting Yatesville Lake State Park in Louisa, Kentucky, the golf course lies in complete isolation from the rest of the world. Designed by the aforementioned Hills & Forrest, Eagle Ridge G.C. opened for play in 2005. 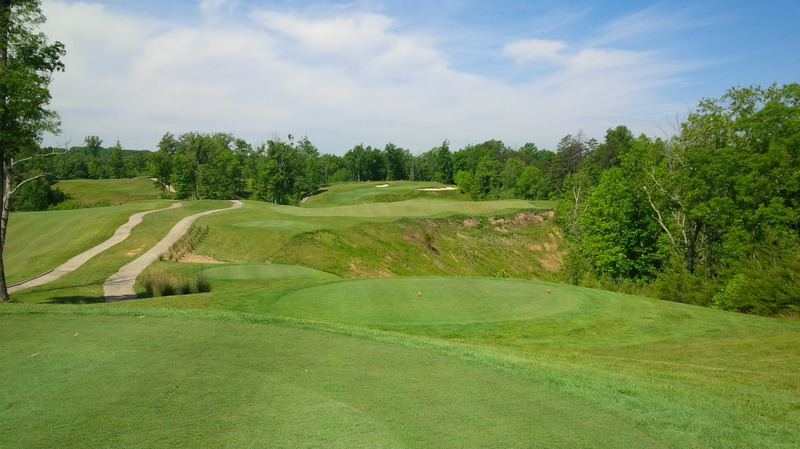 The combination of vast elevation changes, narrow targets, sharp, unforgiving fairway angles, and severe penalties for failure to execute truly make Eagle Ridge one of a kind. Trying to guess exactly how much less club one should choose due to the elevation changes quickly became laughable during our round. I am certain that I would enjoy playing the course much more the second time. I have never used a forecaddie on a golf course, but I think having one’s services at Eagle Ridge would have created a vastly different golf experience. Oddly, not one of the four of us had a golf app that provided any guidance for distances on Eagle Ridge. Admittedly, I allowed the course to overpower me and frazzle my mind and work-in-progress swing more than I should have. The uncertainty and discomfort created by the truly unique layout were more than my fragile mental game could handle. The insanely long, triple fairway downhill par 5 4th hole simply ate our breakfast, lunch, and dinner, leaving the group’s collective confidence in shambles, my swing mechanics a mess, and our spirits humbled. The deceptively long 6th was where I completed my personal meltdown. I don’t remember how many tee shots I took before I finally landed a drive in the fairway. None of this is meant to suggest that we didn’t have fun at Eagle Ridge. After being sufficiently depleted of our stock of golf balls, we played a cart scramble on the back side, which helped everyone breathe a little easier the entire second half of the round. And despite our collective difficulties, we did have moments of brilliance within the four-plus hours of “field hockey” we played at Eagle Ridge. 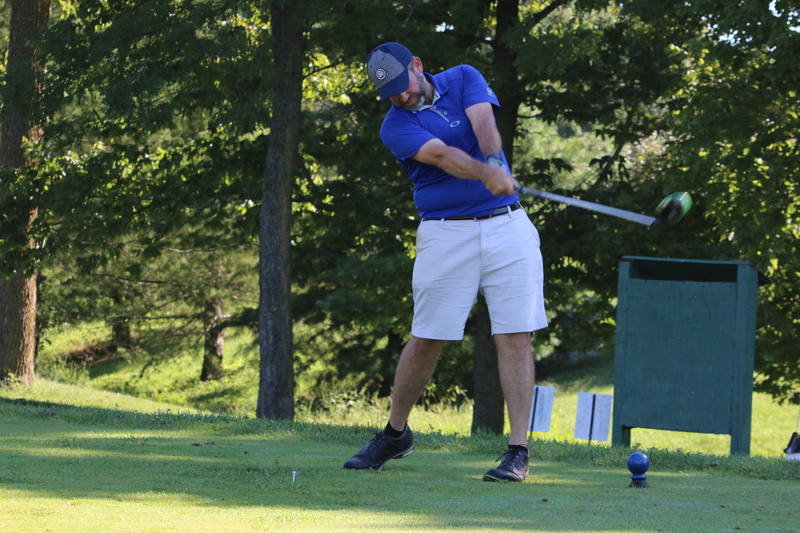 I split the first fairway and hit the first green in regulation (and in retrospect, I should have “dropped the mic” and walked off the course two shots into the round). Mark just barely missed a long eagle putt on the par 5 14th hole, which handicaps as the second hardest hole on the course (disappointingly, that was as close to seeing an eagle of any kind, feathered or otherwise, all day). 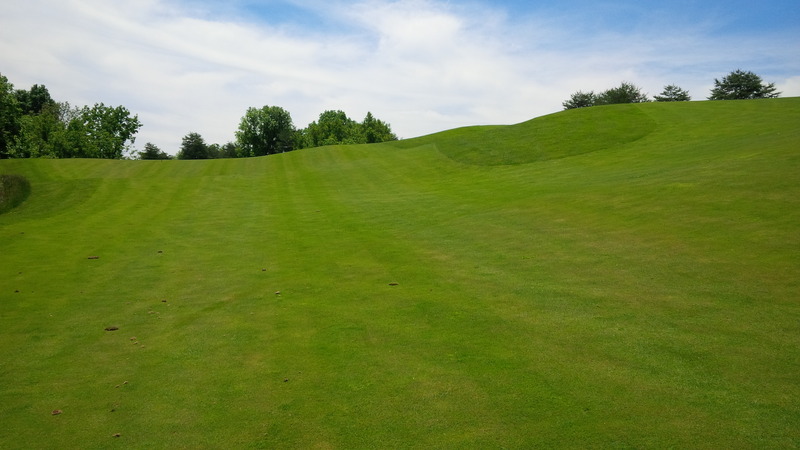 This view of the 11th fairway depicts one of Eagle Ridge’s more “gently rolling” fairway slopes. The land Eagle Ridge is built upon is simply stunning. 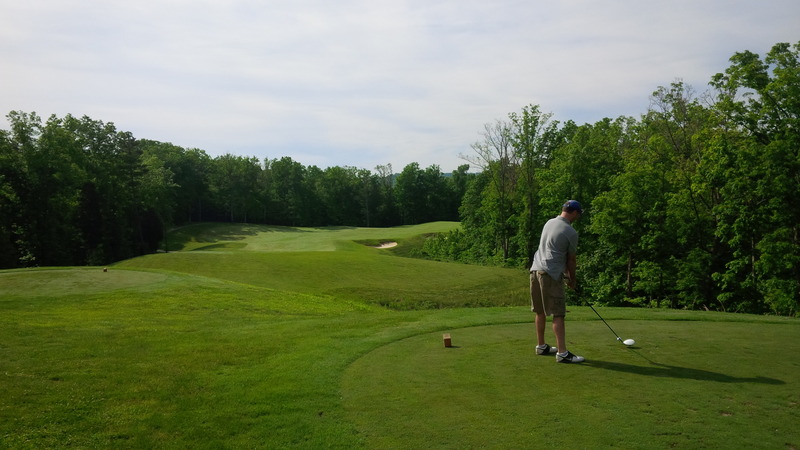 The course is cut from the high-country forests of the Appalachian Mountains, with only enough land cleared to (barely) support the golf course. Despite the high elevation, there weren’t really any stunning vistas to speak of, other than the views of the golf course created by the incredibly elevated tee boxes. 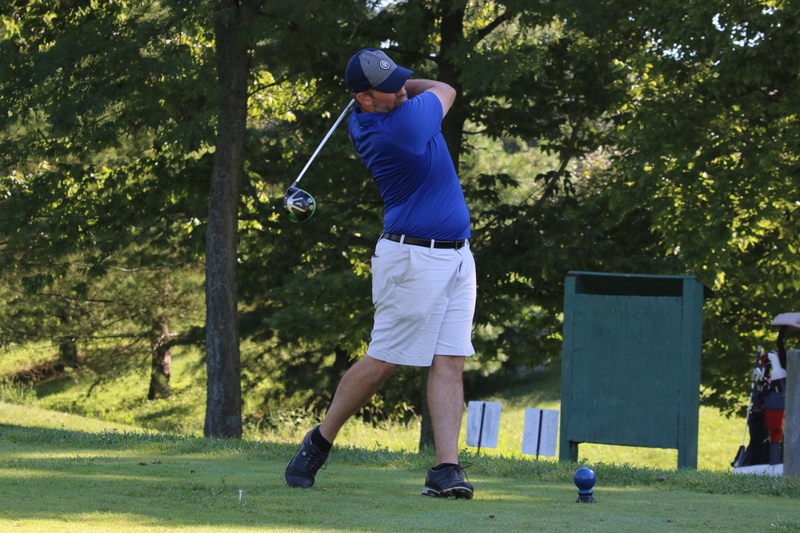 The forest was simply too tall and too thick to allow a glimpse into the outside world, save for one brief view of a cove of Yatesville Lake from the 13th green. This Eagle Ridge feature was a little disappointing, juxtaposed against the stunning, uninterrupted views we experienced at StoneCrest in Prestonsburg. 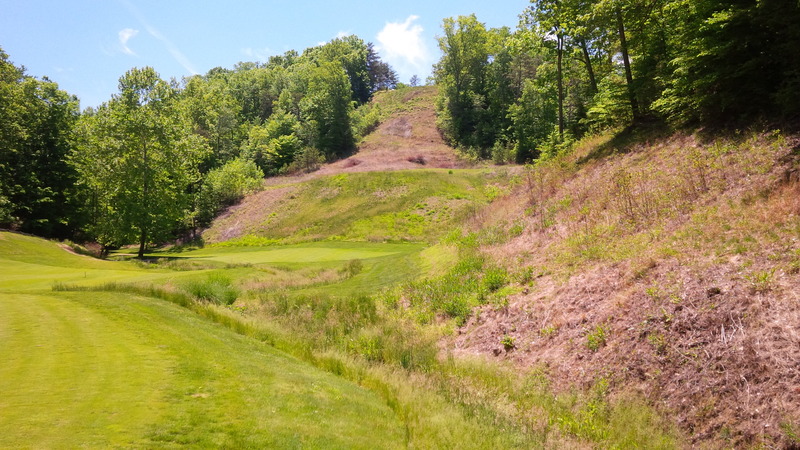 The unquestioned signature hole and highlight of the course is the “short” par 4 13th hole. The 13th hole is unlike anything else I’ve experienced in golf, with the green at the end of a split fairway more than 200 feet below the tee box. 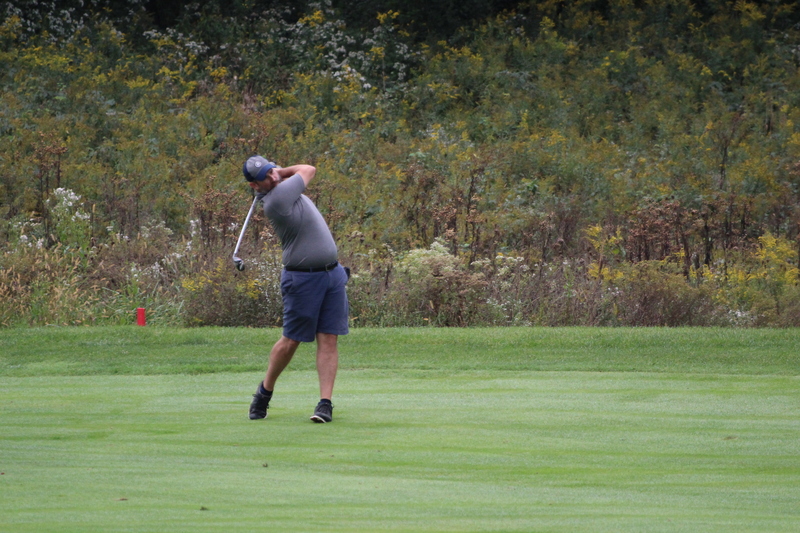 To give you an idea of what elevation change like that does for your golf game, Mark was on the green located 240 yards away, around an elevated, heavily treed corner, in 1…with a soft 5 iron. This is the view of the tee boxes high above the rest of the 13th hole. This view also gives one perspective of how little rough there is to miss a shot in if a tee shot strays from the fairway. The course, overall, was in above-average condition. The bent grass tees and greens were in great shape, and putts rolled consistent and true all day. The bunkers, while full of sand, were hard and unraked. But, bunkers are hazards, after all, and they certainly played like it. The fairways were in good condition overall, though several were aided in appearance from a recently applied chemical bath, with the lovely green dye seen on most golf courses in late spring. Surprisingly, the fairways were generally pretty close to flat, though the areas immediately adjacent to them were decidedly not. Unfortunately, scenes like this were the overriding theme of our collective golf round. There simply was no “good miss” on Eagle Ridge. There isn’t much rough to mow on most holes, as the fairways simply give way to one ravine or holl’er after another. We assumed that the course uses an insane amount of water (from Yatesville Lake, no doubt) to keep the course green. If there ever were a drought, or a problem with the course’s water supply or delivery, the course would literally be unplayable within a matter of days. There is simply no place for a shot to run out and remain in play. Even the most skilled Scottish links golfer would scarcely stand a chance if Eagle Ridge were allowed to dry out. 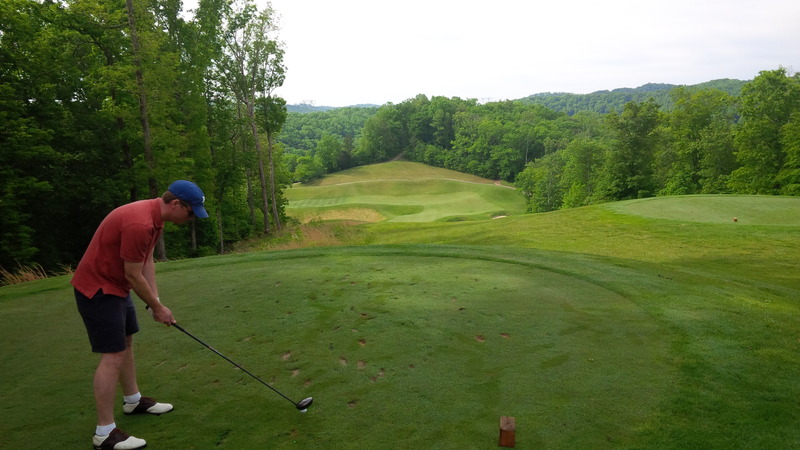 My take away is that Eagle Ridge can be a tremendous golf course. 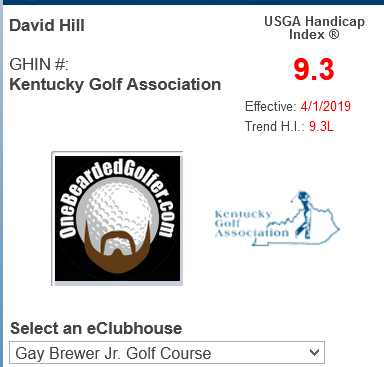 After playing it a few times, with an accumulation of local course knowledge, I would bet that it’s a lot of fun to play, and I look forward to getting back there in a couple of years to see if I can fare any better. Bryan and I were dormie heading into the 18th, but couldn’t get up and down for par to put any pressure on Scott and Mark. To the newcomer, Eagle Ridge is full of terrifying tee shots and awkward angles designed, presumably, to test a golfer’s grit and merit. The course is undoubtedly in a beautiful setting. For me, it was worth the almost two-hour drive into the mountains just to add the Eagle Ridge experience to my collection. I’m a golfer, so I’m part masochist by my very nature, but even I have my limits. Eagle Ridge is a stern test from start to finish. I won’t be making the trek every year, but I do look forward to the next time I get to play the course. Great article. I have added a page to my cabin rental at this course to show some images as well.